Stills’ provides a great demonstration of 50-50 ball technique. An essential part of studying college stars is projecting them to the NFL game. You can’t do that well unless you’re well-versed in the NFL game. Therefore I watch a ton of pro football. One of the terms I dislike that describes an aspect of playing the wide receiver position is “50/50 balls.” The term connotes that the offense is flipping a coin on the fate of a target. There’s also a perception that a target of this type requires a receiver with great physical skill to win the match up. 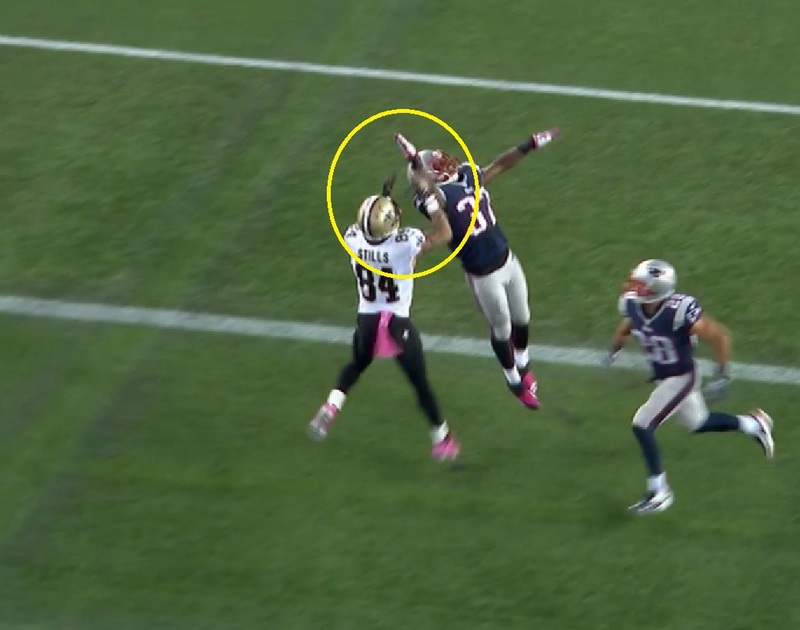 Height, vertical prowess, and strength are helpful, but there is technique involved with winning a “50/50 ball.” His touchdown reception late in the fourth quarter against two Patriots defensive backs is a great example. Here is a frame-by-frame demonstration. Stills begins the play working against Alfonso Dennard in man coverage, getting behind the corner back with a quick fake outside. 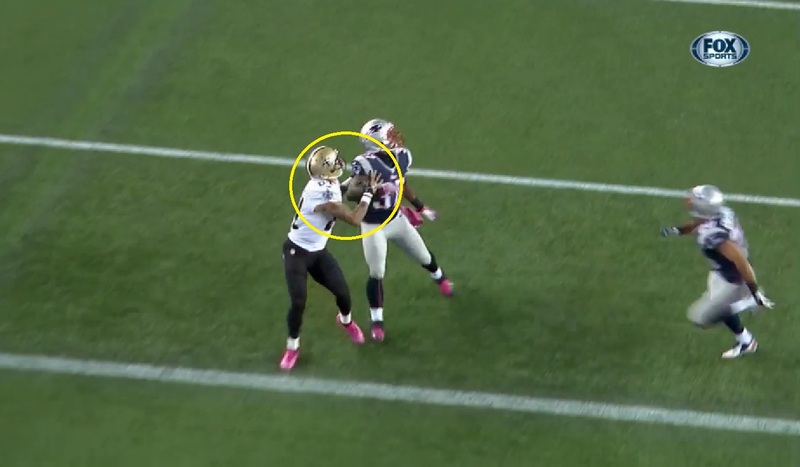 As he works down field, Brees throws the ball with a lot of arc and Stills is forced to wait on the target. 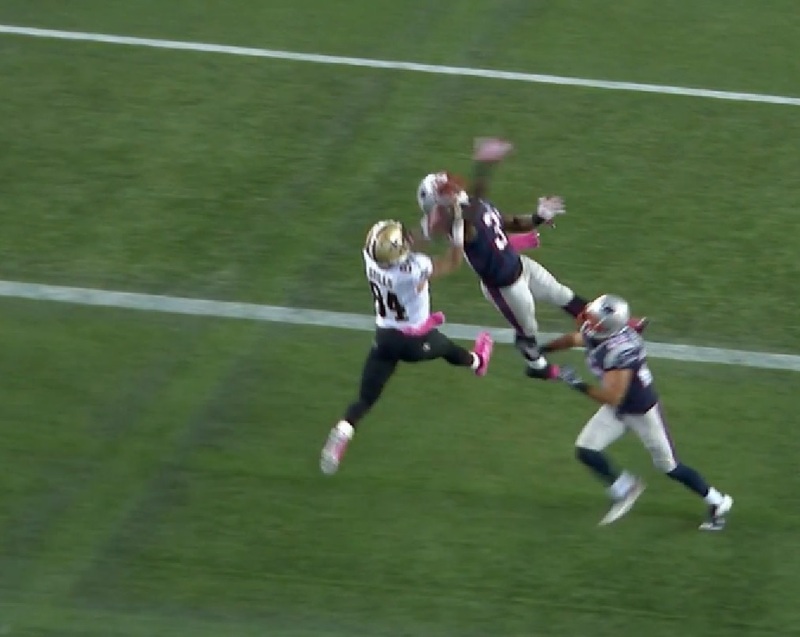 The Patriots corner is in great position: The outside shoulder is in the middle of Stills’ chest and he’s dictating position to win the ball or at least play the pass and present a difficult obstacle for the ball to reach the receiver. However, note the position of Stills’ hands as he and Dennard track the football. 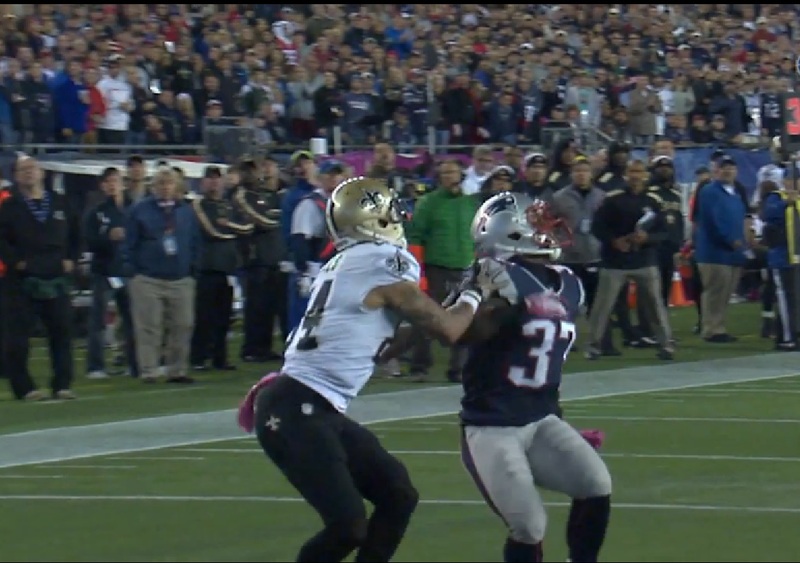 Stills has his hands away from his body, above his chest, and above the arm of the defensive back. This position gives Stills a chance to win the ball without fighting through Dennard’s reach to obtain the pass. The fact that his position is above Dennard’s arm also means he can be first to attack the pass despite Dennard having a better position to the pass. As the ball arrive, Dennard turns and raises his arms to the sky. Stills maintains his position with his hands on the defender’s shoulder and turns his body to face the ball. Stills is now in position to address two contingencies. First, if Dennard gets his hands on the ball, Stills has his hands in position to chop the defender’s arms away from the pass and prevent an interception. Considering the position of the defender, it’s good that Stills recognizes and prepares for his possibility. Second, Stills is facing the target and gaining position to attack the football if it gets past Dennard’s reach. As the ball arrives, Dennard is not attacking the ball as a receiver. He’s not square to the target and he only has one arm raised towards the ball. 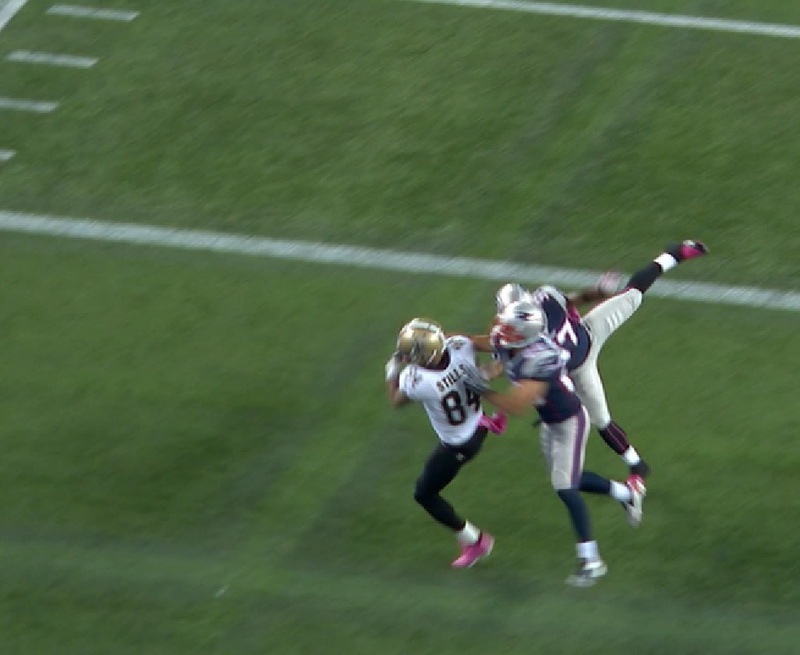 This nullifies much of Dennard’s position advantage and reduces his chances of intercepting the pass. One arm reaching for the ball instead of two also diminishes the chances of the corner even getting a hand on the football. This poor approach to the ball also increases Stills’ chances to make a play, and the rookie has planned well. He is facing the target, both hands are up, and he’s in position to rip the ball loose of Dennard’s grip or attack the ball as a receiver. The ball arrives just inside Dennard’s reach and Stills makes a successful attack on the target, catching it with good hands technique: arms extended, palms facing the ball, and fingers up. 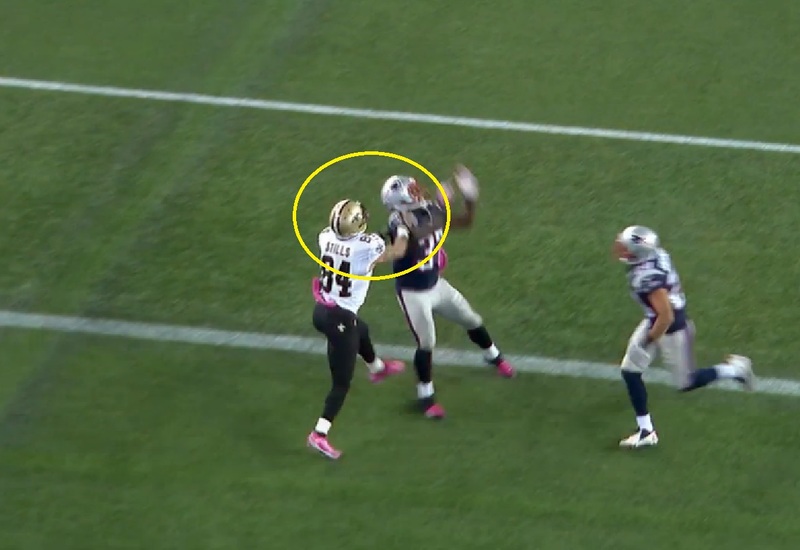 As soon as Stills makes the grab, he does the best possible thing, use his body to shield the safety. The rookie turns outside the defenders and gives a cold shoulder to the safety, preventing a successful rip and enhancing his chances of securing the ball as he falls to the ground. This is the type of play Stills has demonstrated much of the preseason and it’s why he’s seeing red zone targets in Week 6 of the regular season. This is in direct contrast of a play I profiled of Stills last year where you can see him struggling with the appropriate hands technique in the red zone. This is a different type of play, but the emphasis on body and hand position remain important. This play is a great demonstration of a young player demonstrating veteran savvy and technique. For more analysis of skill players like this post, download the 2013 Rookie Scouting Portfolio available April 1. Prepayment is available now. Better yet, if you’re a fantasy owner the 56-page Post-Draft Add-on comes with the 2013 RSP at no additional charge. Best, yet, 10 percent of every sale is donated to Darkness to Light to combat sexual abuse. You can purchase past editions of the Rookie Scouting Portfolio for just $9.95 apiece.